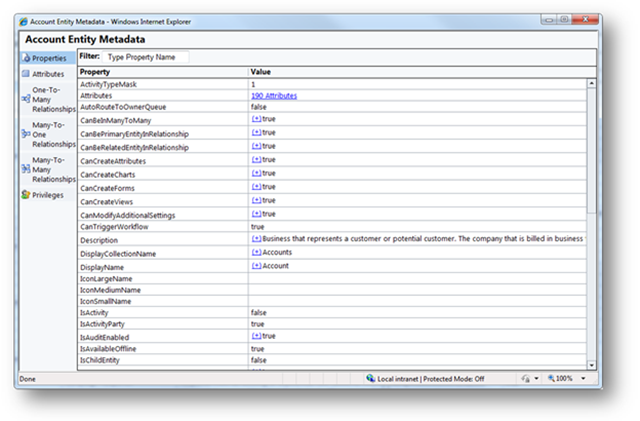 People have been asking “Where is the metadata browser in Microsoft Dynamics CRM 2011?”. 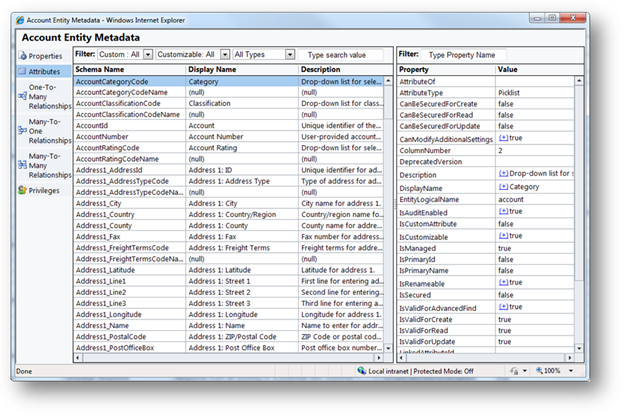 For those of you who don’t know what the original metadata browser was, see Metadata Browser. 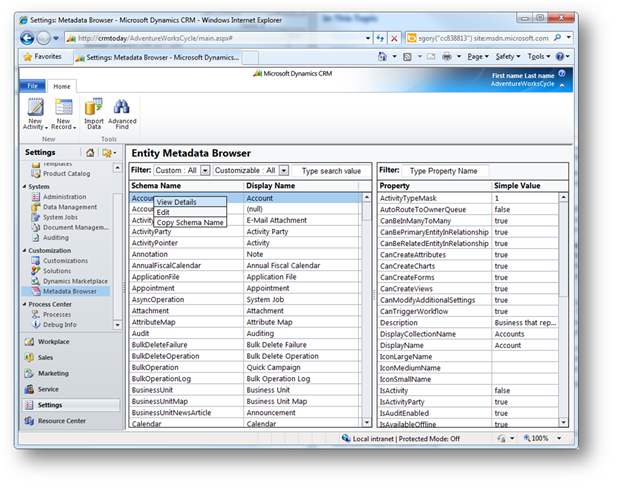 The original metadata browser was removed from CRM 2011. 1. 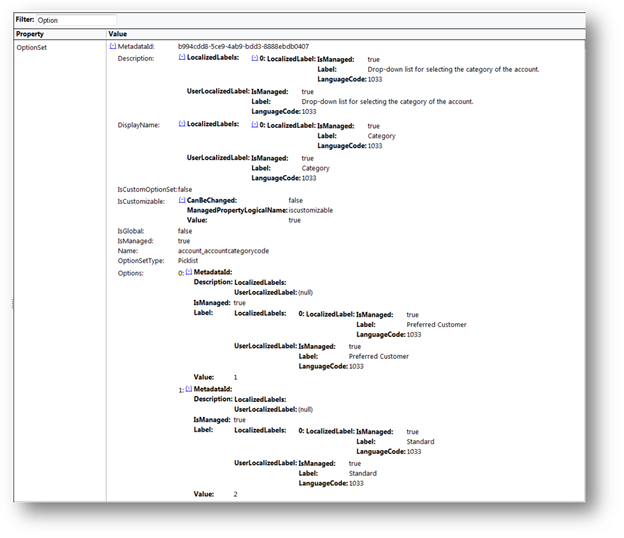 Download the SDK (here). After you install the Entity Metadata Browser it will appear in the Customizations area. For the Properties grid, you can filter the list of property names. This properties grid shows only the simple values for the properties. In reality, many of these properties are objects with many more additional properties. For the sake of simplicity only the most useful property value is shown here. To view all the details for an entity, you need to right-click the SchemaName value and choose View Details from a context menu. For those entities that appear in the default solution, you also have the ability to select Edit which will open the entity definition in the default solution. When you view the details for an entity, a new window opens and you can navigate to each of the more complex properties. The Properties view allows you to drill down and see all the details for the complex properties. Properties for the selected attribute appear on detail grid. For OptionSet (Picklist) attributes you can view all the options and expand down to view all the properties for the option set. Similar details are available for entity relationships and privileges. Most property names and simple values can be copied to your clipboard by right-clicking and choosing the Copy option from a context menu. At this point, complex property values do not support being copied to the clipboard. Although it is included in the SDK, it isn’t a sample. We aren’t publishing the source code since the vast majority of it is just rendering the UI and that really has nothing to do with Microsoft CRM. The Metadata browser is done using HTML and JScript Web resources. It doesn’t use JQuery or any other supporting libraries. The SDK.Metadata.js sample library from the SDK is used to retrieve data. A much simpler sample and the full code for that library is published in the SDK at Sample: Retrieve Entity Metadata using JScript. I hope that this solution will help you explore, understand and make productive use of the Microsoft CRM 2011 entity metadata.